Fried green tomatoes are a staple in Southern kitchens. But the way that I prepare my fried green tomatoes differs from the many others. 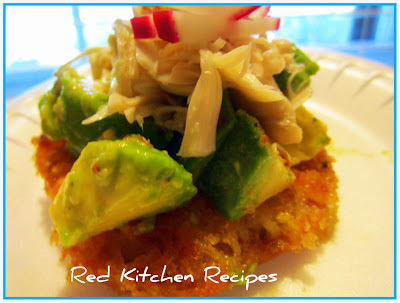 I like mine topped with diced, lime - garlic infused avocado, lump crab meat, and julienned radishes. It's a great combination of tart, sweet, and crunchy! Many friends of mine have beautiful vine - ripened tomatoes resting on their kitchen counters these days. I actually found this tomato at The Fresh Market. It's an heirloom tomato that looks just like the ones that my brother has harvested from his own garden. It was green when I bought it, but it wasn't by the time that I got around to cooking it. It was still a little underripe when I cooked it, though. So it still works for this recipe. My fried green tomatoes are dredged in beaten egg, then a panko parmesan mixture, then cooked in a pan with a small amount of olive oil and butter. Is this why my sweet husband Jereme and daughters Gianna and Sasha constantly thank me for cooking them good food? I couldn't ask for any better compliment! Slice the tomato about a half inch thick. Season with salt and pepper. Set aside. Combine the panko and parmesan. Dredge the tomato in the egg, then the panko and parmesan mixture. Coat both sides, then set inside the fridge to let it adhere well, about 10 minutes. Heat a large skillet, then add the olive oil and butter. Cook the tomatoes about 3 minutes per side, then drain onto a paper towel. Cut the avocado into little chunks. Squeeze the lime juice over it, then season with salt and garlic powder. Toss, then top the tomato with it, then add some crab meat and radish. So good I took multiple pics! !